During stoichiometry calculations you will be often forced to convert between volume, concentration, and number of moles of substance (or its mass), or - in case of gases - between number of moles and volume. EBAS has a built-in concentration and ideal gas calculators to simplify such calculations. In the stoichiometry calculations example you have calculated mass of phosphine evolved in reaction between calcium phosphide and water - it was 4.479 g. Let's assume pressure is 749 mmHg and temperature is 21 deg C. What is volume - in mL? 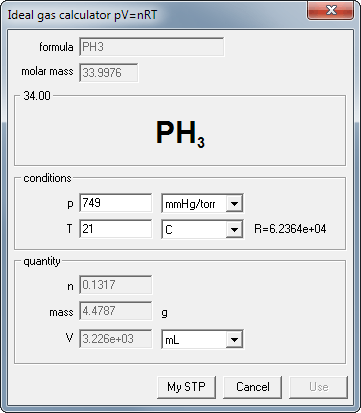 If you have still opened reaction dialog with mentioned reaction just click on the pV=nRT button below phosphine mass (in the output frame) - formula, molar mass and known mass of the substance will be copied into calculator. If not, click on the pV=nRT button on the tool bar and enter formula and mass into edit fields. Note, that depending on the way ideal gas calculator was started, some edit fields can be disabled. Select proper units from the dropdown lists, enter given pressure and temperature - and read the result! Nothing more. 4.479g of phosphine at given conditions occupies 3225.6 mL. 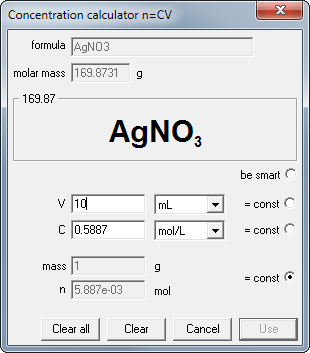 Note that ideal gas calculator can be used for conversion between the mass/moles and volume not only in the output frame - it can serve the same purpose when entering known amounts of substances in the upper, input frame. Second useful tool is a concentration calculator. It can be started just like ideal gas calculator using n=CV buttons from input/output frames or from the tool bar. Concentration calculator can be used for any calculations involving mass/moles, volume, and concentration. If you know two of the values, concentration calculator will calculate the third. For example - what is the molarity of silver nitrate if 1 g of the substance was dissolved in 10 mL of water? enter 10 into volume edit field. Ready. Just read the concentration. It takes less time to do it, than to read the previous paragraph.